Changed to Massoth Hand Held and tried 14/28 and 128 Speed Steps all had no effect on lighting but the Loco still ran ok. Anything obvious that I have missed please? Avoiding the question a bit but AFAIK the 23460 comes factory decoder fitted. Did you or previous owner remove the supplied decoder? Did you just plug the decoder in, or remove any existing boards? Lights are probably 5v bulbs, if no regulators in the loco, you may well have 'popped' them. If no other board, you would need to be more creative, to get the correct lighting patterns. Is there cab-light? - If so, does that work, and can you control it with the light-key? Thanks for your input guys, but things are a little strange. Nah mine had a Direct Decoder Sticker and the 4 Spigots to put the wires to. No Decoder circuit removed, it was a Blue one like 70246 which is indeed a Direct Decoder Loco. But the sticker on the bottom is certainly 23460? Hmm curious. Decoder wired in as above to 4 spigots on the board. Bulbs were the flat topped ones that I thought were the DCC higher voltage ok ones. 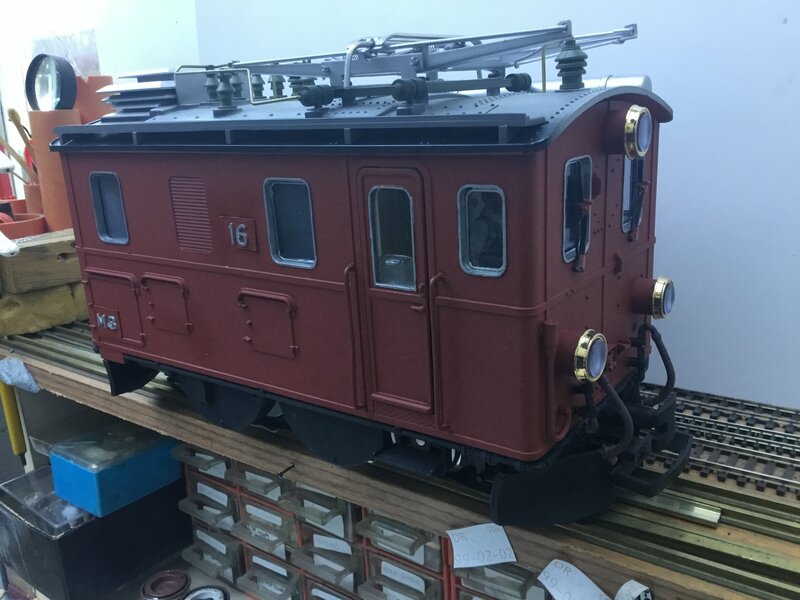 Nothing changes by using the Cab Switch, have used Track Power on lower voltage lights before and they do not pop immediately so curious and confusing. Probably best if I pop the Top off again to take a couple more pictures of the beast and underside. CV52 Switch Command Lights Front, 128, Light Button Forwards Direction only. CV53 Switch Command Lights Rear, 64, Light Button, Reverse Direction only. Not sure why using the F1 CV51? If using the F1 key to operate the lights the value of CV52 would now be 129, and the value of CV53 now would be 65. A typo of mine cv51 0 to USE BUTTON 9? Thanks John. Will try the other options. 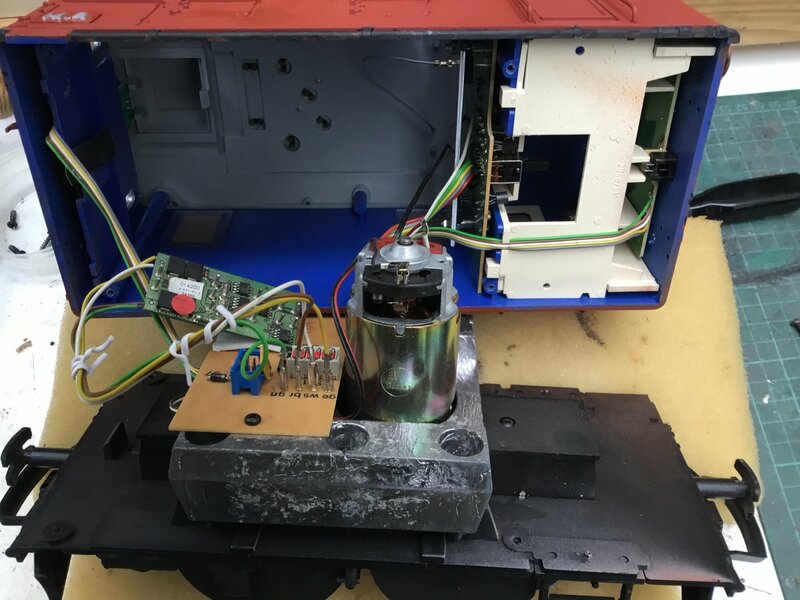 Meanwhile here are a couple of pics of the beast, as can be seen inside it was certainly a All Blue one as per 70246 Direct Decoder as shown on the base. Which makes things a little odd as according to the LOK Book 23460 is a Chip Board Fitted FO one. As this was a second hand one from a well known emporium one wonders if a little mix and match had been going on? I am beginning to wonder if that board really is a Direct Decoder one as it does not have a set of Plug Holes for the Decoder? 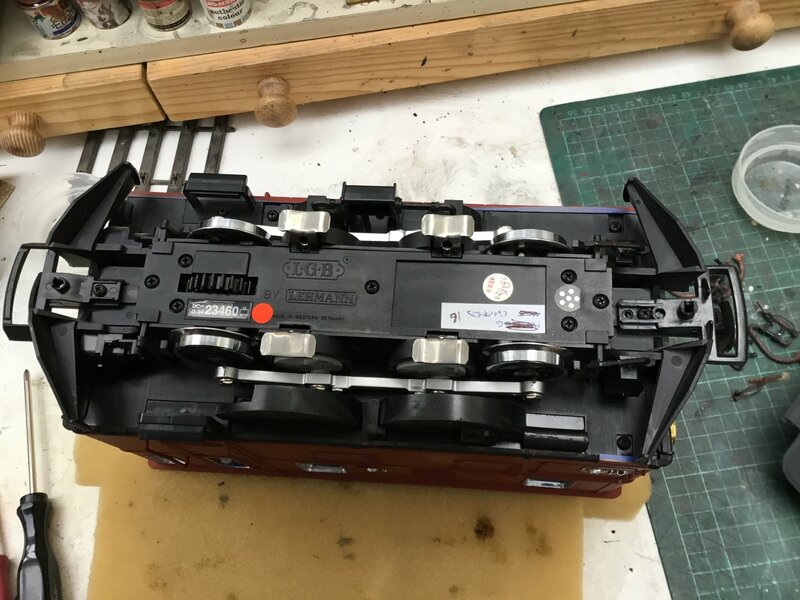 If so I have botched it into an old banger but at least it runs OK.
You need a 6-way into the blue socket, to connect onto the pins on the 55021..
You only appear to have the track and motor connections er ... connected. ??? eave it as is thanks, going to a friend FOC that can sort out the lights if he wants to. Unless I find a Plug somewhere that will do the job! OK so found a Direct Decoder Interface Wire, wired up with a different Decoder that does not have wires attached, Nothing. 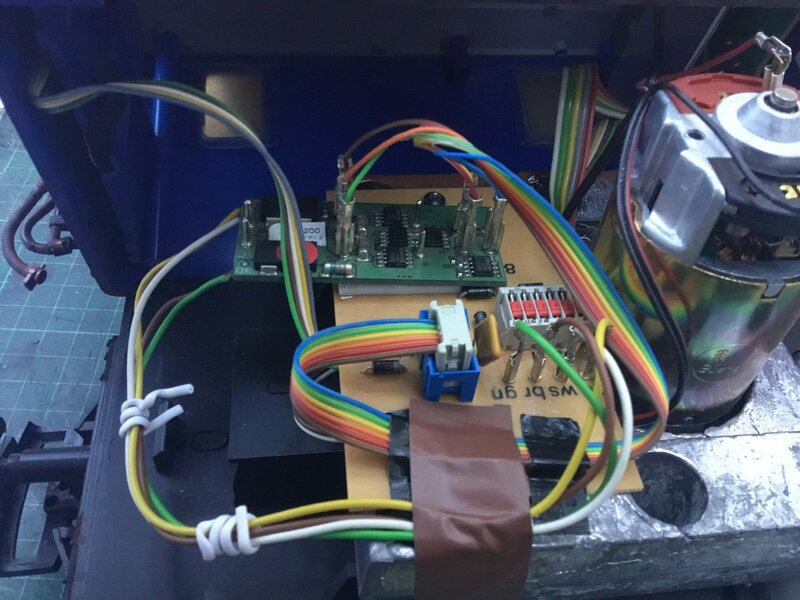 So back to the original Decoder now wired via the Interface Cable all the 4 Original Wires suitably Insulated with Chip Wires pluggedcin as per John Posting.. Nothing! Hmmm...... All the dips were turned off etc. Tried to read Decoder on Prog Track Nothing. .Just unplugged Direct Decoder Wire, Dips to Normal tested on Analogue and all Lights as expected. Aa you say weirder and weirder, just thinking through out loud what to do next, would try the decoder connected to a test rig chassis, just to confirm it's still working. Then I'd jerry rig a couple of cables up to try the "pins" for the lights on the decoder, multimeter first, test for voltage, then either bulb or LED with a resistor, will either confirm yes or no that the decoder light outputs operate as they should, if yes, closer inspection of the 23460's innards, would be next. Good call will give that a worl. What I never did with either Decoder was to try direct connection to the 4 Pins on the Board as I did earlier, this is what started this plea! Have tested LGB Chips to a Sound Decoder but not Lights as they tend to not bother me but this is now becoming personal! Oh so with the 6 wires from the Plug connected to the appropriate 6 pins on the Decoder as in the diagram from John S, I also need to connect the 4 wires from the Decoder to the Loco as I originally did! Hm thanks will try that today. Many thanks Muns. Can you help with another matter? I am after a spare 6 pin Plug to go on my Massoth Central Station. The Green one where the wires screw into the Terminals and the Plug goes in the back of my CS. I have the original in my Shed and would like another in my workshop. Thus enabling me to connect up the Massoth Central Station to my Test Track indoors whe the need arises. I will have some of the DiMax connections in stock soon (they are on order). The four discrete wires, are track and motor.. The 6-way is the ancillary lights, functions etc. So thanks to Muns and now PhilP all is well. They say you do not know what you do not know and I did not know about this form of Direct Decoder. In the past I have always just plugged them in! Pic below shows all the wires in case anyone else runs into the same issues that I did not knowing what they did not know etc. And note all the Dip Switches are not set at On. Still all is well and Lights all now working ready to be delivered to Somerset next time I visit. Labelling is MkB for Mikeysbahn Bahn. Number 16 as per the Chip. Pic below on the Test Track to show what she looks like after I have completed the repaint from Blue. Should go nicely with Mike’s other RHB Brown Electric Locomotives. On LGB decoders (55020/55021) for F1 a 1 or 9 is the same thing as you need to add 8 to LGB function numbers for serial and parallel operations, 2 or 10 for F2, etc. As ever although I got the beast running, I wanted it forwards with the Driver at the Front and CV adjustment would not achieve that, also the lighting was correct for forwards going backwards to me. My DCC Brain tried a few options with no change then the Analogue part of the brain kicked in. Swopped the 2 Motor Wires around Yellow and Green on the Pins of the above pic of the insides. Success. Mark 1 Analogue Brain 1 MTS Nil!